Route. 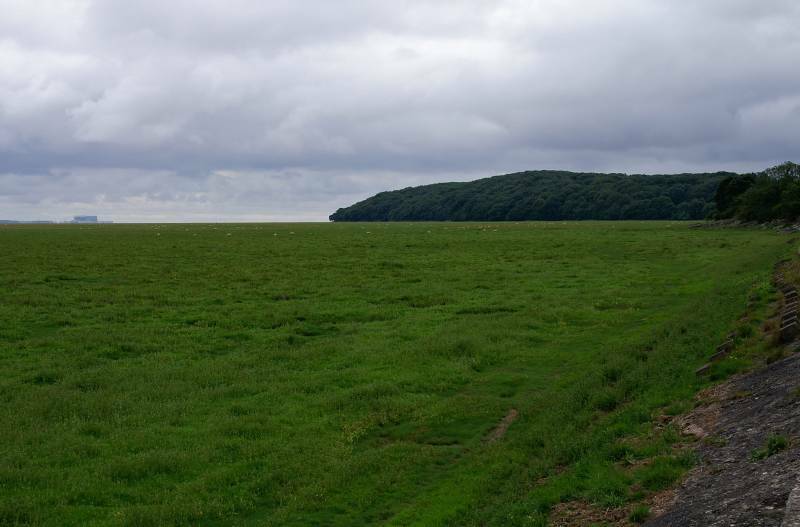 Grange-over-Sands - Kentsford Road - Kents Bank - Kirk Head End - Wyke Farm - Humphrey Head - Wyke Farm - Allithwaite - Church Road - West Barrow Lane - Grange Fell Road - Spring Bank Road - Fell End - Hampsfell - Eggerslack Wood - Grange-over-Sands. Notes. 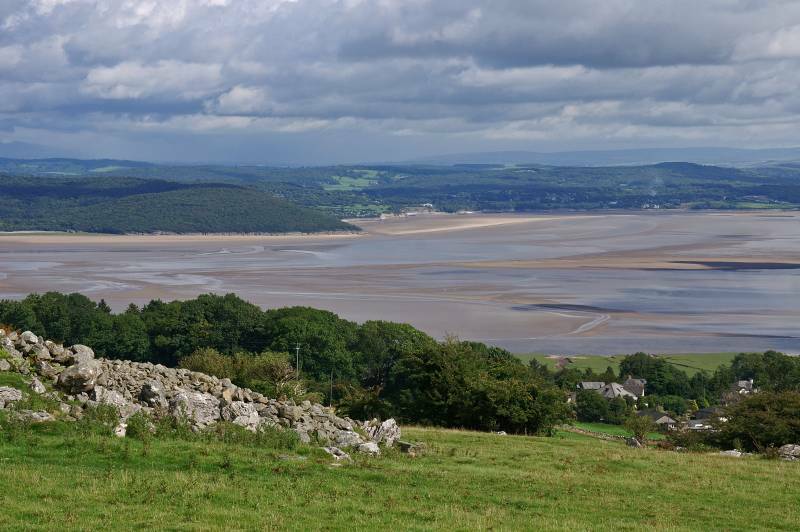 If you've been walking with me in the past you'll know we've always viewed the finger of land that is Humphrey Head from afar, more than likely from the Silverdale/Arnside coast, the time had come to take a closer look, see what delights this whale back of Carboniferous limestone has to offer. I'd be telling lies if I said I'd never been there before, as a spotty 10 year old me and a couple of mates would get dropped off at Kents Bank, we'd procede to dig bait before making our way to Humphrey Head. Scrambling up the cliffs we had great fun Flounder fishing before being picked up later in the day. The bay has changed beyond recognition since those early outings with rod and line, sand and mud have been replaced by coarse grasses and sea washed turf, all attempts to irradicate the problem have failed, now sheep are left to keep the coast line manicured and pretty, it works to a certain extent, I quite like it. Taking the opportunity to visit a small corner of Cumbria she has neglected in the past, Sue is with me leading the way with a new found enthusiasm, it's rather unnerving. Along the coast by tarmac and beach we rambled, eventually reaching Kents Bank where we crossed the railway line for the second time, the final stretch of coastal walking rounded Kirkhead End to access Wyke Farm. A short stretch of bridleway then lead between dry stone walls to access the western face of Humphrey Head, from this side a path allowed access to the high ground. 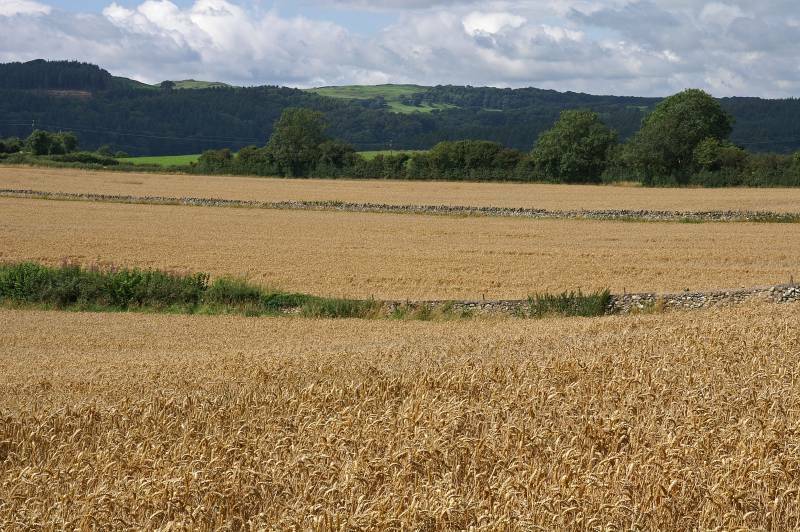 After a short wander around we re-traced our steps to Wyke Farm, here we joined a path (Cumbria Coastal Way) that lead through a number of fields before reaching Allithwaite. 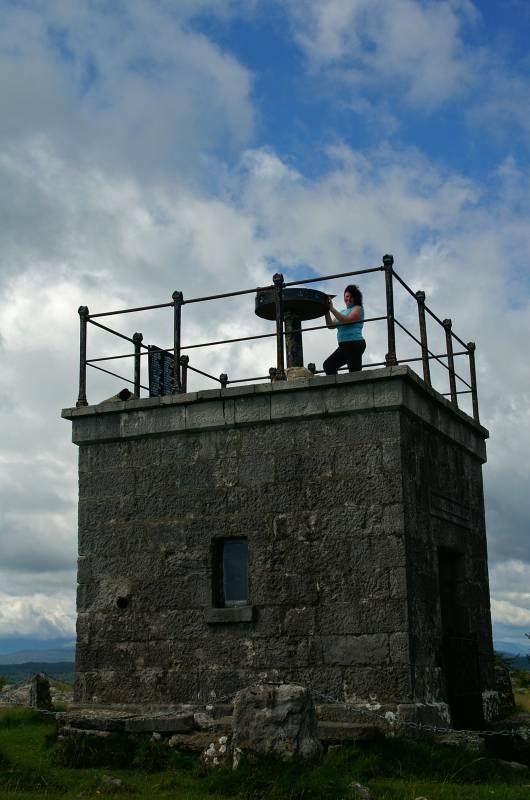 The next section was the boring bit, by tarmac road and lane, by field path and yet more tarmac we wandered, eventually reaching a slit stile that allowed access to Fell End, a short grunt followed to gain the summit. To the north Hampsfell with it's Hospice lay almost within reach, a short walk on good paths and we were there. 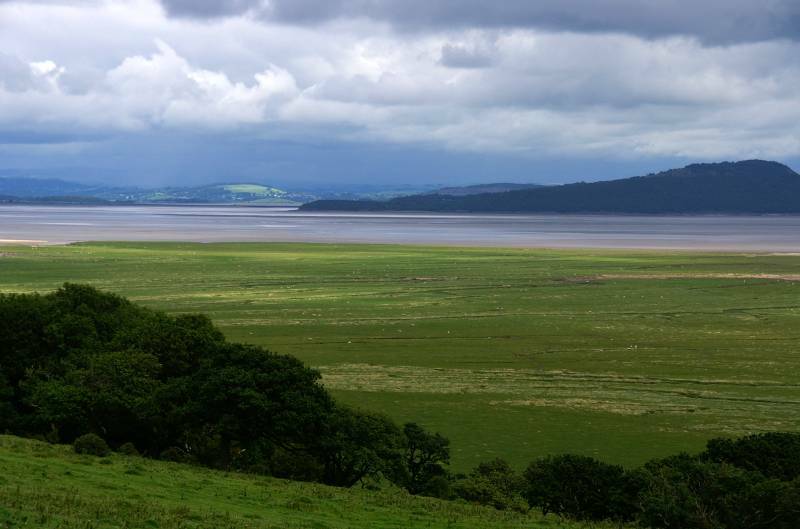 It was down hill from here, descending through Eggerslack Wood before reaching Grange-over-Sands once more. 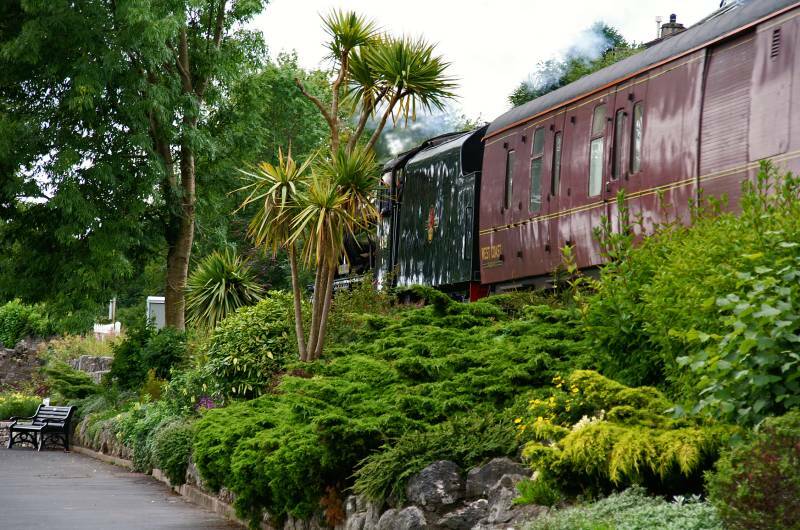 Our day started with a comedy of errors, we arrived in Grange to be welcomed by the sound of a steam train making it's way along the edge of the estuary, an ideal photo opportunity, in the frenzy of activety that followed the lens cap jammed on, the camera refused to switch on then refused to switch to multi shot mode, out of several photos this was the only one that looked anything like a steam train. 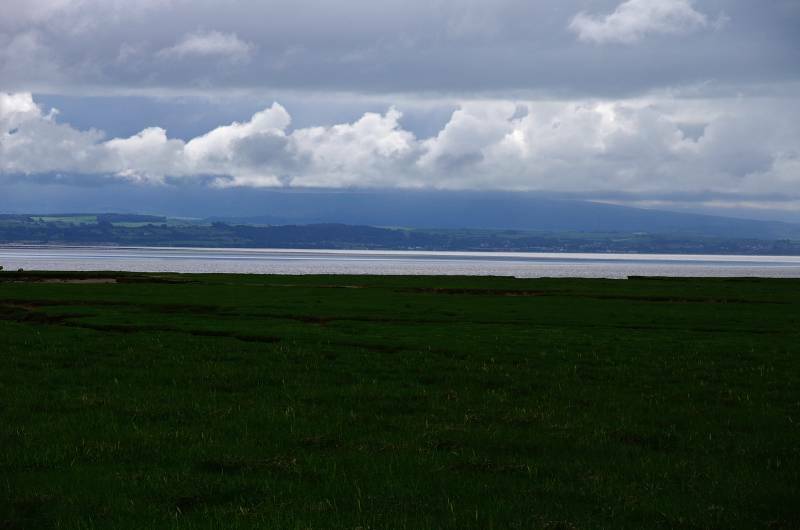 From the sea front at Grange views to the Silverdale coast. 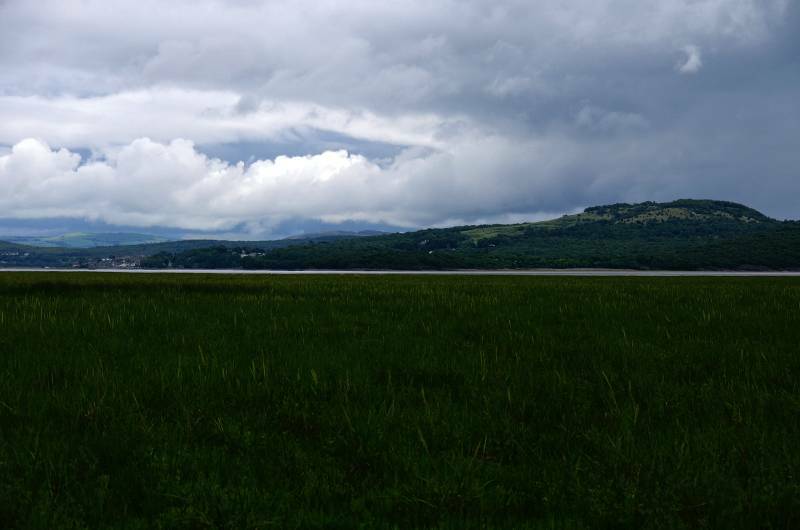 Storm clouds over Arnside Knott. Seen from Kents Bank the sylvan slopes of Humphrey Head. 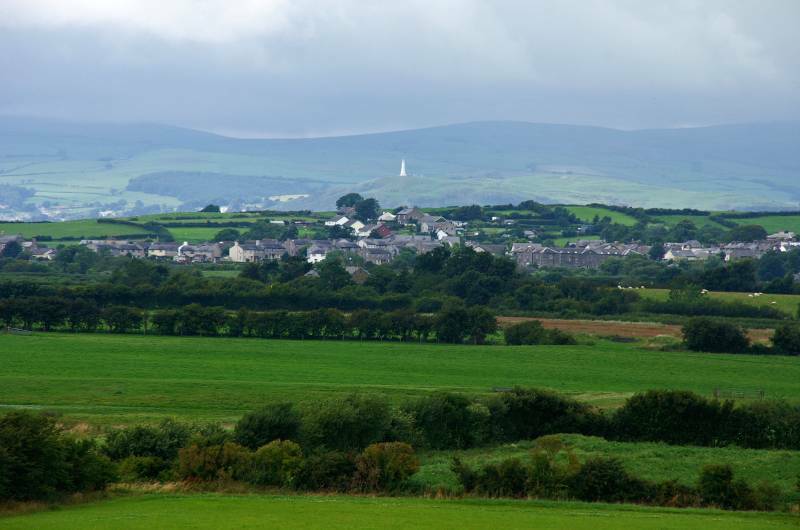 In the distance, with a new coat of paint the Hoad Monument stands on Hoad Hill above Ulverston, in the centre of the shot Flookburgh. 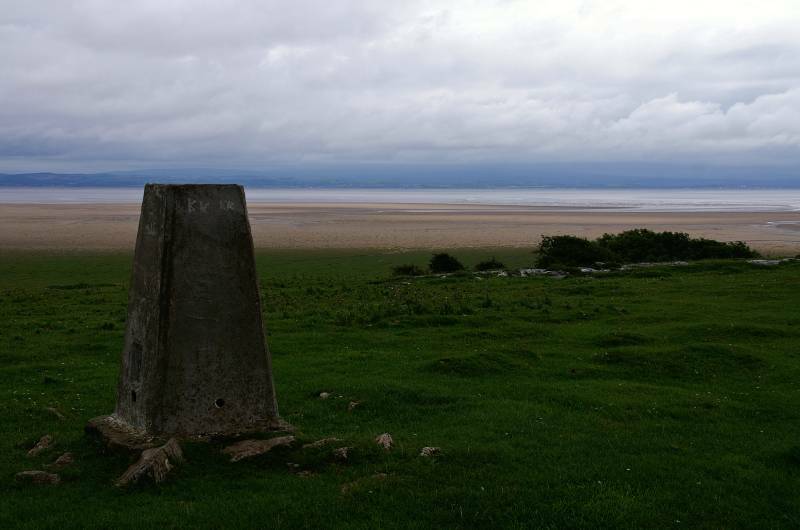 The summit of Humphrey Head with a wonderful view across Morecambe Bay. 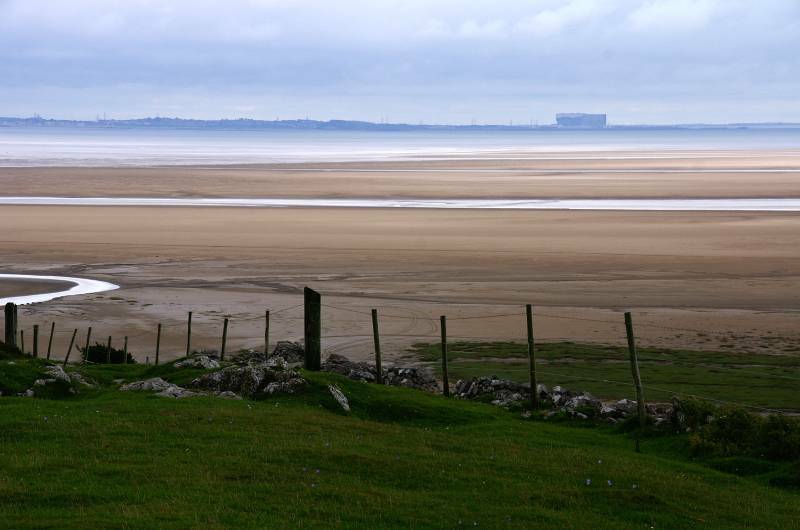 The sharp profile of Heysham Nuclear Power Stations. like a giant liner moored on the Lancashire coast. 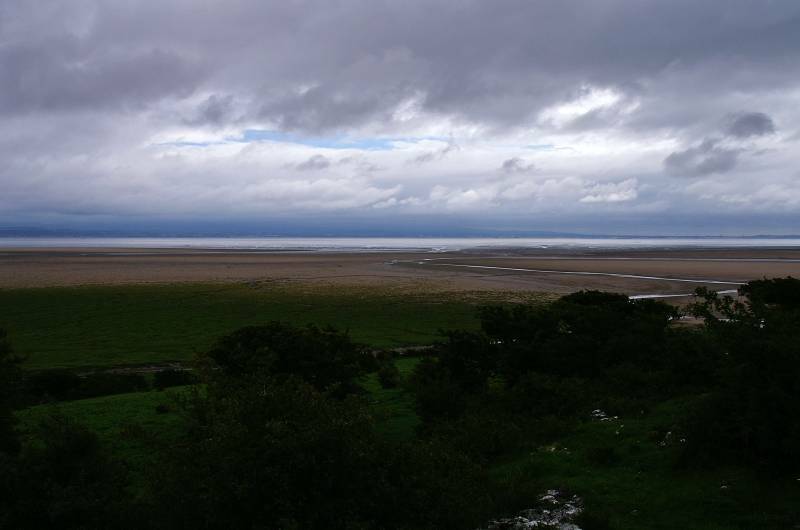 Fading into a blue/grey horizon the Lancashire coast. 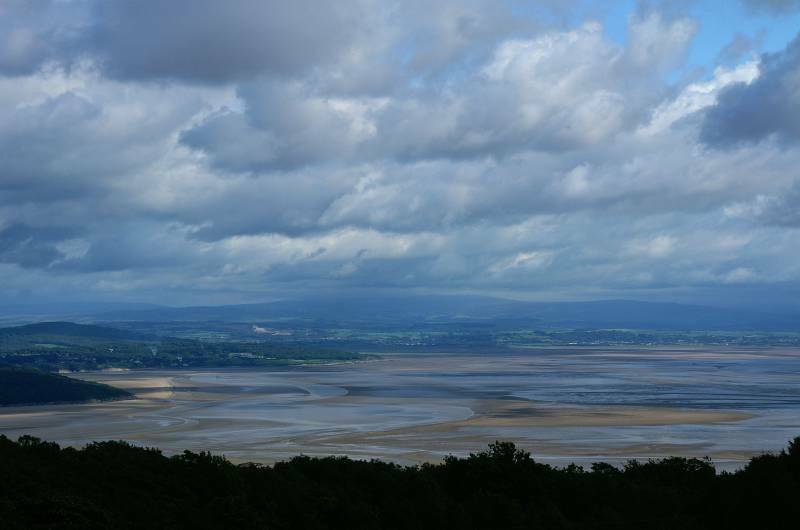 Seen from Humphrey Head, the heavily wooded slopes of Arnside Knott with a hint of sunshine on the rounded mound of Heversham Head to the left. 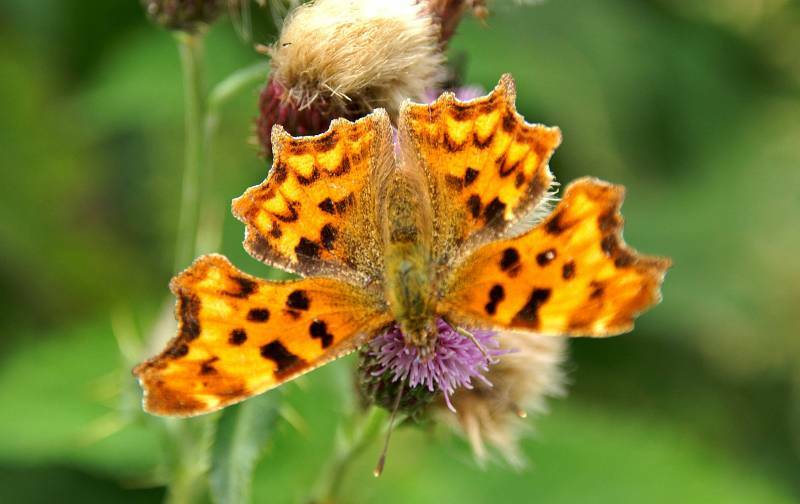 ....as did this beautiful Comma. 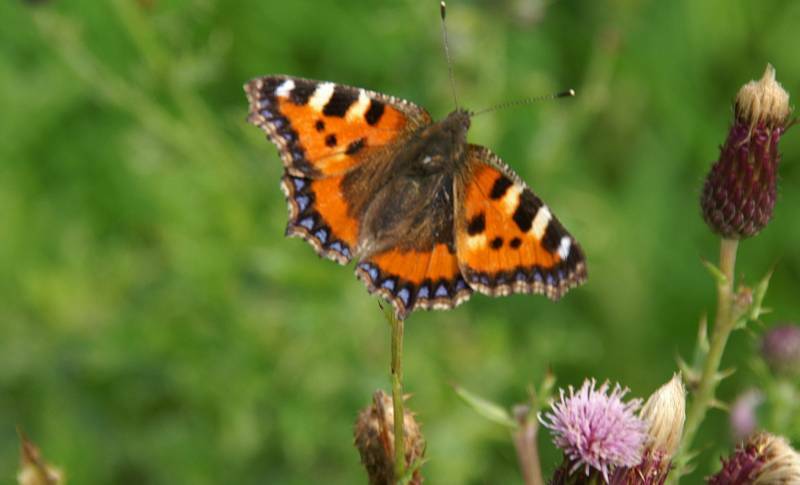 I may know the names of a few Butterflies but cereal crops I don't, fields off West Barrow Lane above Allithwaite. Ascending Fell End looking back to Humphrey Head, with Heysham Power Station dominating the horizon. 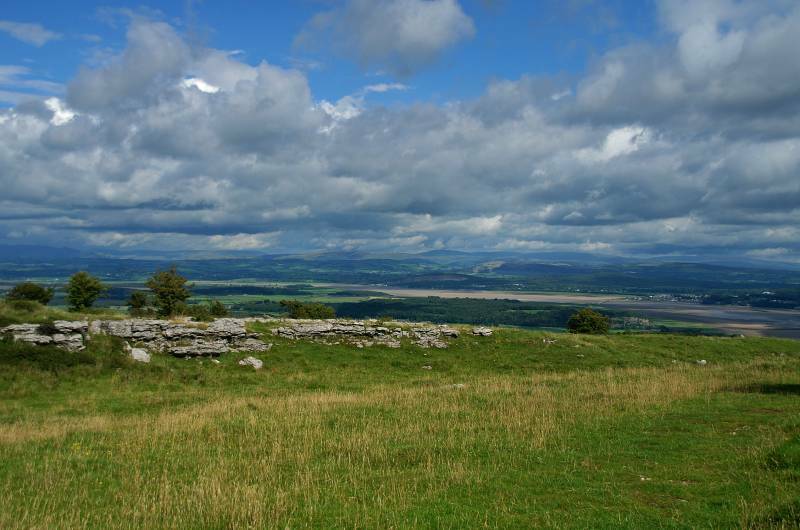 On high ground with views to Arnside Park and the Silverdale coast. 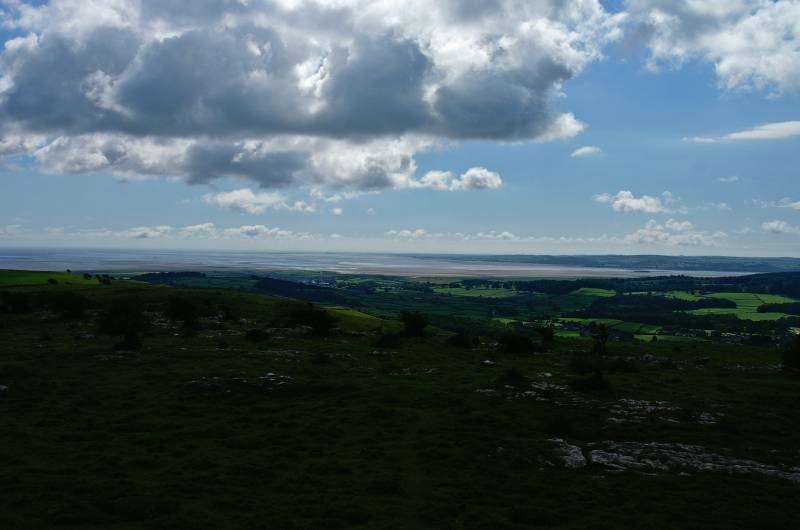 Wonderful views from the saddle between Fell End and Hampsfell, the Kent Viaduct and the Arnside coast. 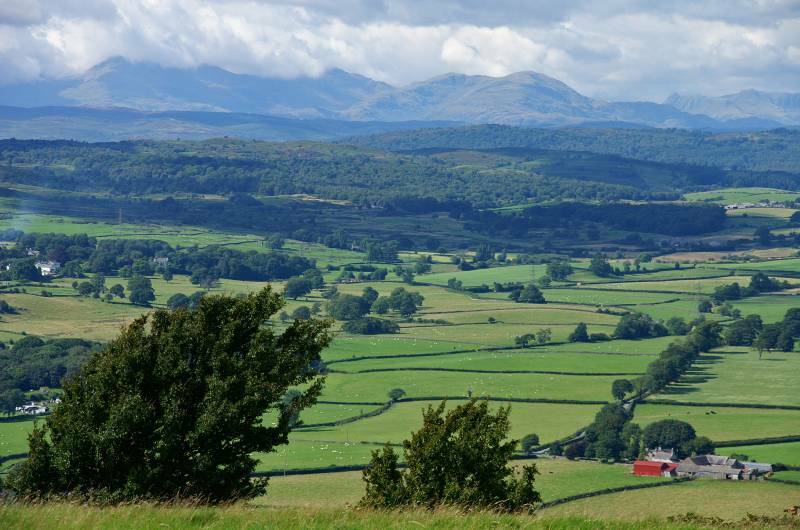 Seen across the Vale of Cartmel dressed in a crown of cloud, the Coniston massif. 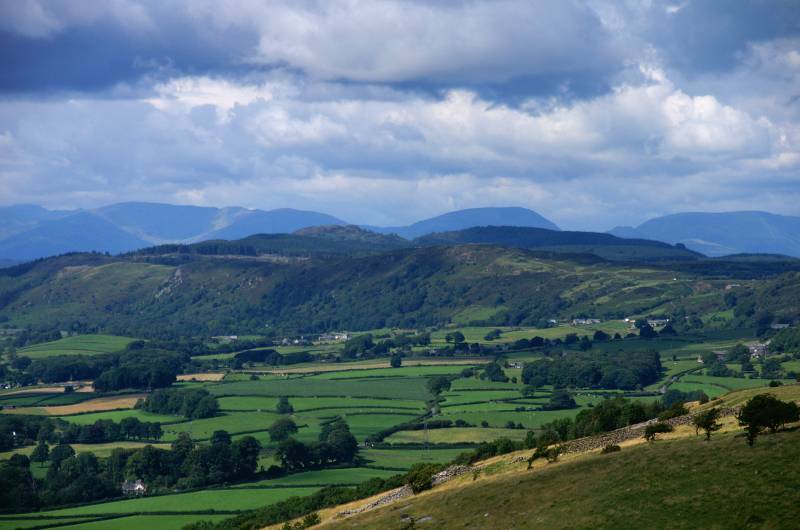 Seen from the summit of Hampsfell a blue/grey crown of Lakeland hills, to the left Fairfield, the right Coudale Moor, taking centre stage Red Screes. 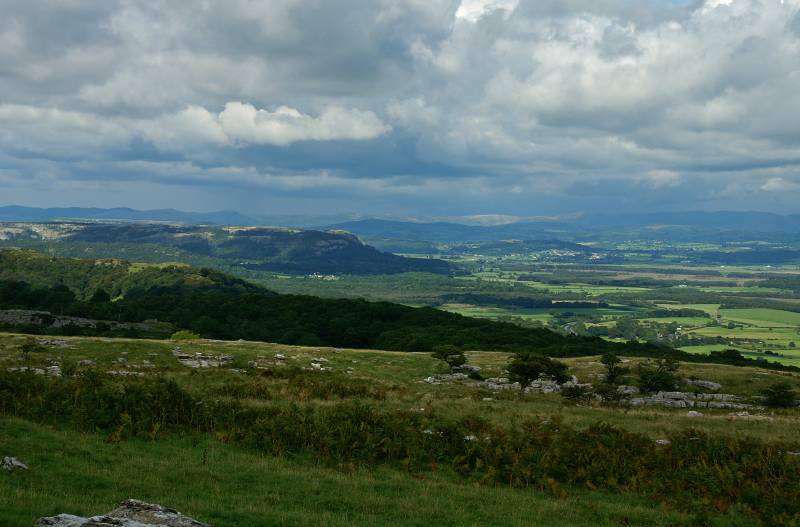 Sue soaks up the views from the Hospice on Hampsfell. 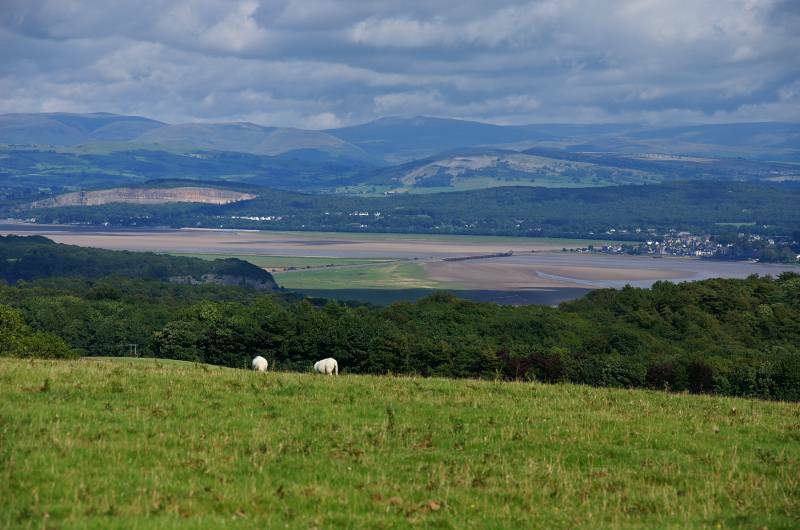 A stunning view across the Vale of Cartmel and Ulverston Sands, with the Furness Peninsula disappearing into the distance. Gracing the northern skies the Coniston Fell and Langdale Pikes to name but a few. 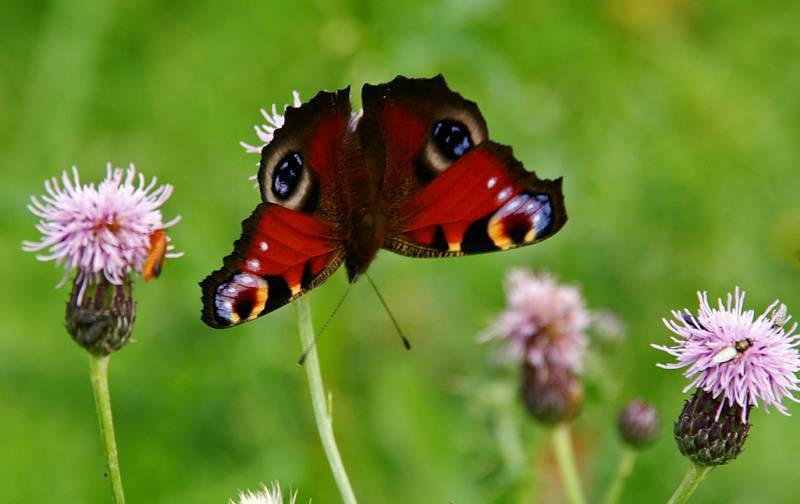 This is the view that was to accompany us to the tree line, how many times did we stop to admire it, I lost count. 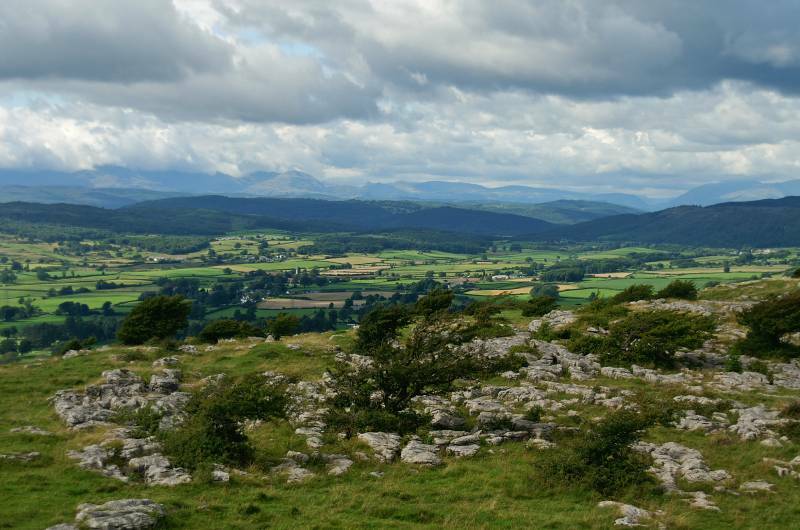 Seen over Eggerslack Wood, in shadow Whitbarrow Scar backed by the Whinfell Ridge and Howgill Fells. 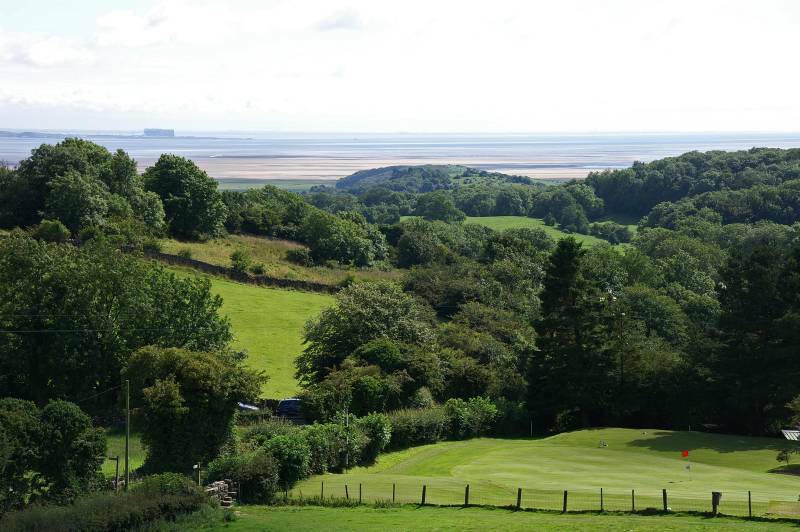 Over the tree tops of Eggerslack Wood the Silverdale coast, across the skyline the hills of Bowland.